A view of Battle Harbor in Labrador. The fishing village dates back to the 1700s. Looking out at the remains of a 1,000-year-old Viking village on a lonely spit of land in the northernmost reaches of Newfoundland, it’s easy to imagine how this critical piece of history could be overlooked for so many centuries. But it was here, beside a beach scattered with seal bones, a good 500 years before Columbus that the great human migration came full circle. Roughly 100,000 years after Homo sapiens first set foot outside of Africa and populated the rest of the world at a near sprint, the Atlantic Ocean remained a bridge too far. It was desperation that led a band of Vikings to try, sailing west of Greenland, hugging the coasts in their shallow boats, in search of timber and iron, the equivalent of their moonshot. When they landed upon these shores, heaving their boats onto the beach, they encountered natives, whose ancestors had arrived thousands of years before via the Bering Strait. The circle closed here, two human gene pools separated by tens of thousands of years, meeting at long last. The Stone Age and Iron Age colliding suddenly on a beach battered by the North Atlantic. It’s a zap of history, the kind that causes one’s spine to tingle when encountering it. But Newfoundland and its mainland provincial sister Labrador are chock full of such moments of awe, owing to their powerful relics of human history and simply jaw-dropping scenery. Until Annie Proulx’s award-winning novel “The Shipping News” was published in 1995, Newfoundland, let alone Labrador, were hardly on the tip of many travelers’ tongues. When looking at a map of North America, Nova Scotia, and Prince Edward Island looked plenty remote yet comfortably accessible. Newfoundland and Labrador remained something of a curiosity to those who enjoy tracking their trans-Atlantic flight progress on a seatback screen. I never forgot the fictional Quoyle, Proulx’s lovable, down-on-his-luck newspaperman. (Nor his dietary habits: “He ate prodigiously, liked a ham knuckle, buttered spuds.”) The book kindled in me a desire to visit the alternately harsh and striking scenery of Quoyle’s voluntary repatriation, a place mysterious in its remoteness. With time to spare and a heat wave to flee, I finally made the journey this past summer with my pup Gingersnap, a wolverine-honey badger mix. I had a rough idea of where we were driving in our Subaru — to the less-populated western spine of Newfoundland with its surprising bounty of natural wonders and World Heritage Sites. When I noticed a dotted line between Newfoundland and Labrador on my map, I impulsively decided to hop a ferry there as well. After all, how many people can tell their friends they’ve driven to Labrador (close to zero) and describe what it’s like to be pitching distance from an iceberg (the temperature suddenly drops 10 degrees, and the air smells strikingly sweet)? First stop was Gros Morne, a jewel in Canada’s National Park system. Here one can hike atop the Earth’s mantle. The Tablelands are hard to miss — a massive flat-topped, Martian-red protrusion of igneous rock typically found at least 20 miles below our planet’s crust, but which surfaced 500 million years ago as continents collided. Staring at it is akin to peeking at the undersides of a massive uprooted tree; something we’re typically not supposed to see. Then there are the breathtaking inland fjords, 2,000-foot rock walls abutting a large lake formed by glaciers. When the glaciers receded, the land between the ocean and mountains rebounded, locking in water so pure it’s nutrient deficient and practically empty of plant life. 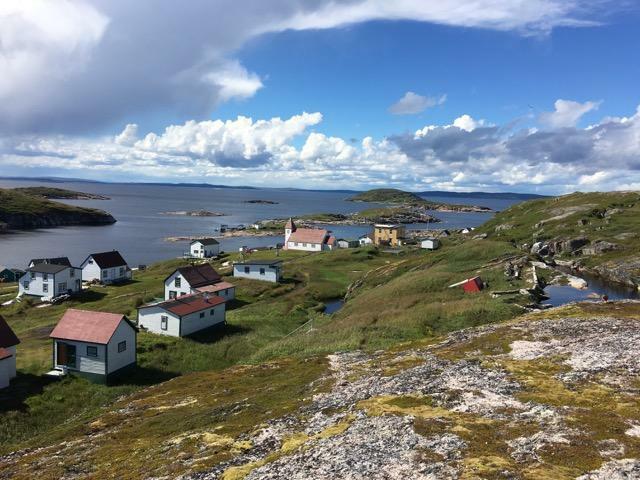 The Viking landing site at L’Anse aux Meadows is three hours up the coast, a stunning drive of rocky outcroppings dotted with tiny fishing villages. The park guides, mostly locals, revel in sharing the area’s history. If you’re lucky, you may catch a storytelling night, when they dress in garb and recount Norse stories inside a sod longhouse. If you’re a fan of “The Shipping News,” you’ll want to take a long look at the craggy coast, covered in wild berries during my visit — it’s where Proulx lived as she researched the novel, Quoyle’s ancestral home. It takes only a 90-minute ferry ride to set foot on an even more remote and sparsely populated land of rutted roads and dirt highways, riotous rivers with leaping salmon, handsome lighthouses and rolling tundra. An hour or so up the coast is the town of Red Bay. A village of just 250 residents today (with the best fish and chips ever), it was the center of Basque whaling four centuries ago. There’s an extensive museum, where, among other things, one learns that a chalupa is more than a crispy tortilla with protein options. In the village of Mary’s Harbor, Gingersnap and I boarded Captain Timmy’s little skiff and headed out to hunt giant icebergs in the mist, behemoths of ancient ice, wandering islands that have traveled for several years to reach these shores as they silently soldier on to inevitable oblivion like March snowmen. As the clouds parted and minke whales surfaced beside us, we steered toward the island of Battle Harbor. A restored fishing village dating back to the 1700s when it was an important center for catching and salting cod, Battle Harbor, with its carpet of wildflowers, pure air, and unparalleled views, is hands down the most remote and beautiful place I’ve ever been. And with a scattering of rooms in beautifully restored guesthouses (gourmet meals included! ), it’s also one of the most romantic. As the sun set in spectacular fashion while I motored back to some semblance of civilization, I noticed a roadside marker I had missed earlier. A few minutes later I was standing beside North America’s oldest known funeral monument. Four feet beneath the trampoline-size mound of earth, unknown peoples buried a young teen boy, face down, his skin painted red with ochre and wrapped in pelts, a bone whistle placed beside his head. Eight thousand years ago. Try as I might to walk back to the car, I was frozen in place, the zap of history causing my skin to goose-bump, my mind trying to picture the people who bid goodbye to their child in this cold soil atop a windy hillock overlooking a gray sea. Their lives the day before, the day after, and the moment of this burial. The drive is not for the squeamish. It’s a good 12 hours from Boston to Cape Breton, Nova Scotia, where one catches the seven-hour ferry to Port-aux-Basques on the southwestern tip of Newfoundland. There are plenty of other options, such as flying to Cape Breton, or even to Deer Lake, the gateway to Gros Morne. But with a chance to see the Bay of Fundy’s tidal bore for the first time, and take a detour to PEI’s Malpeque Bay to eat oysters as sweet as gumdrops, I opted for a road trip. Andrew Blechman can be reached at andrewblechman@mac.com.